Tamiya 32568 a 1:48 Scale German Tank Destroyer Marder III M Plastic Model Kit from the Military Miniature Vehicle Series. Suitable for Ages 10 and Older. This is Tamiya 32568 a 1:48 Scale German Tank Destroyer Marder III M Plastic Model Kit from the Military Miniature Vehicle Series. Suitable for Ages 10 and Older. The Marder III series tank was designed using the chassis of the obsolete 38(t) tank made by the Czech company CKD. This tank destroyer was developed to counter the Russian T-34 and KV-1 tanks. The initial version of the Marder was armed with the PaK 36(r) 7.62cm anti-tank gun. 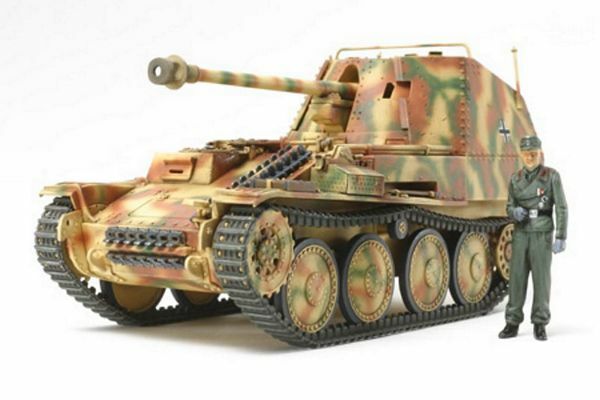 Addition versions of the Marder were created based on the 38(t) tank. The series culminated with the development of the Marder III M, which differed from the earlier models. The Marder III moved the engine to the center of the tank and the fighting compartment to the rear of the vehicle. This revision lowered the profile of the crew compartment allowing for additional armor plates for protection. Between May 1943 and May 1944, 942 Ausf. M tanks were produced.